Ben Meares and Christian Francis introduce us to a scientist who is hell bent on solving the mysteries of the puzzle box. The Science of Madness is a wickedly inventive tale where a scientist has only three days left to discover the secrets of the puzzle box even though it defies all manner of rational explanation. The art for this story by Peter Bergting builds on the drama wrought by the scientist’s frustration, before the solution which finally presents itself delivers a most unexpected climax, one that even confounds the Cenobites themselves! Hellraiser Bestiary has been one of my favourite titles over the last few months. Each issue has featured some great stories and excellent artwork, making them all superb additions to Clive Barker’s Hellraiser legacy, and I certainly hope that we get to see another Hellraiser anthology series from BOOM! Studios. The Cenobites are suffering terrible losses in their war with a new breed of Demon, creatures that are seemingly impervious to attack. They are also using the bodies of the fallen Cenobites to form a massive Glyph of the Solutent across the surface of the Labyrinth. Having saved D’Amour from a Raparee, Tiffany and her friends travel into the Labyrinth with the New High Priest of Hell and join the battle. Using a protection talisman and a demon slaying knife, they drive the invaders back and leave Butterfield at the mercy of the Cenobites. Tiffany is shocked when she learns D‘Amour has been lying about her adoptive mother, Kirsty Cotton, and that he secretly knew where she was all this time. Armed only with her demon killing knife and protection talisman, Tiffany remains in Hell and begins searching for Kirsty. Hellraiser the Dark Watch #8 plunges Tiffany deep into the hidden depths of the Labyrinth as she continues her quest to find her adoptive mother. Clive Barker and co-writer Brandon Seifert have constantly made Tiffany’s character one of the most interesting aspects of this title. She has a rebellious steak, her relationship with Kirsty is another highlight, and Tiffany’s determination to find her “mother” remains the series predominant driving force. Tiffany strikes up an uneasy alliance with Butterfield, the major adversary from Lord of Illusions, who she rescues from his Cenobite interrogators. Although he no longer has any arms, Butterfield is still the master trickster of old, convincing Tiffany to free him so he can lead her to Kirsty. The art by Tom Gracia captures every gruesome detail of the Cenobites shadowy realm of pleasure and pain. Mid-way through the issue Butterfield’s body splits open and he metamorphoses into a horrific worm creature, bristling with claws, with only his human face left fused atop the slithering abomination. Gracia seems to delight in creating these gloriously macabre creatures, Butterfield’s new form is truly repugnant, as is the way he can now ensnare people to gets up close and personal with his victims. Butterfield guides Tiffany to a vast chamber filled with gleaming crystals and delicate glowing orbs. Kirsty Cotton and Elliot Spencer are trapped inside one of the small glowing orbs, a mind prison, one of Leviathan’s tortures. Tiffany finds herself inexplicably drawn into the orb, where she is reunited with Kirsty and ends up fighting Spencer. Once they manage to break free of the orbs influence Tiffany confronts D’amour about why he lied to her, but before the Pontifex can explain, the Labyrinth begins to collapse around them as a terrifying new threat appears. Hellraiser the Dark Watch #8 concludes with a flesh rending twist that few could have predicted. Clive Barker and Brandon Seifert continue to expand the scope and scale of this Hellraiser series, drawing together several plot elements as the issues builds towards its gut wrenching cliff-hanger. Together with Tom Gracia’s art and Valadimir Popov’s excellent colors, Hellraiser the Dark Watch #8 is one of the series best issues so far. 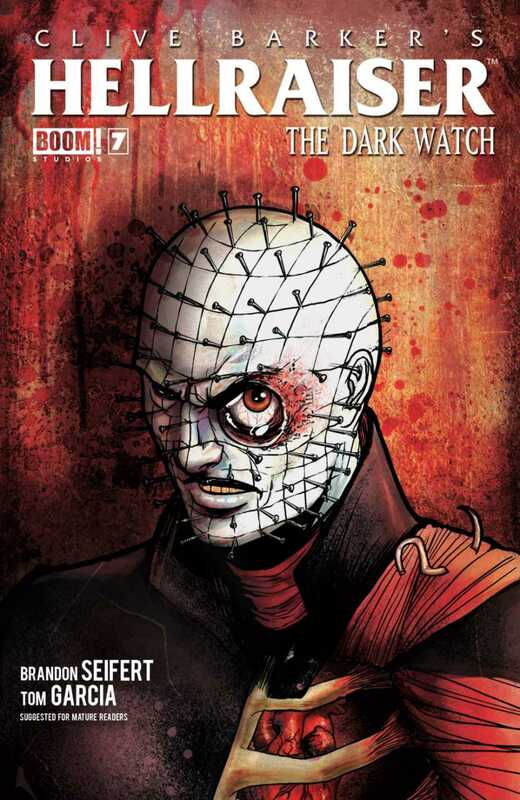 Hellraiser The Dark Watch #7 continues this new era of Hellraiser by Clive Barker and co-writer Brandon Seifert, as the Cenobites are confronted by a new enemy; Tiffany continues her search for Kirsty Cotton. Ex private investigator Henry D’Amour has become the new High Priest of Hell, but the Cenobites only follow him grudgingly and Leviathan’s realm has come under attack by a rival faction of demons. While the female Cenobite watches the conflict unfold, Tiffany and her allies begin to wonder if D’Amour has become corrupted by his new role. In the Labyrinth the Cenobites are forced to retreat as the Heretics defile their domain, unable to attack them while they are protected, they await word from their Pontifex for a solution. The female Cenobite watches as the demons arrange the bodies of the fallen Cenobites on the ground, and she slowly begins to realize that they are using the corpses to construct a massive Glyph of the Solutent on the surface of the Labyrinth to encircle Leviathan. This new ongoing series from BOOM Studios continues to expand the mythology of the Hellraiser universe, as Clive Barker and Brandon Seifert set the stage for the next chapter in power struggle between the Cenobites and a new breed of demons. 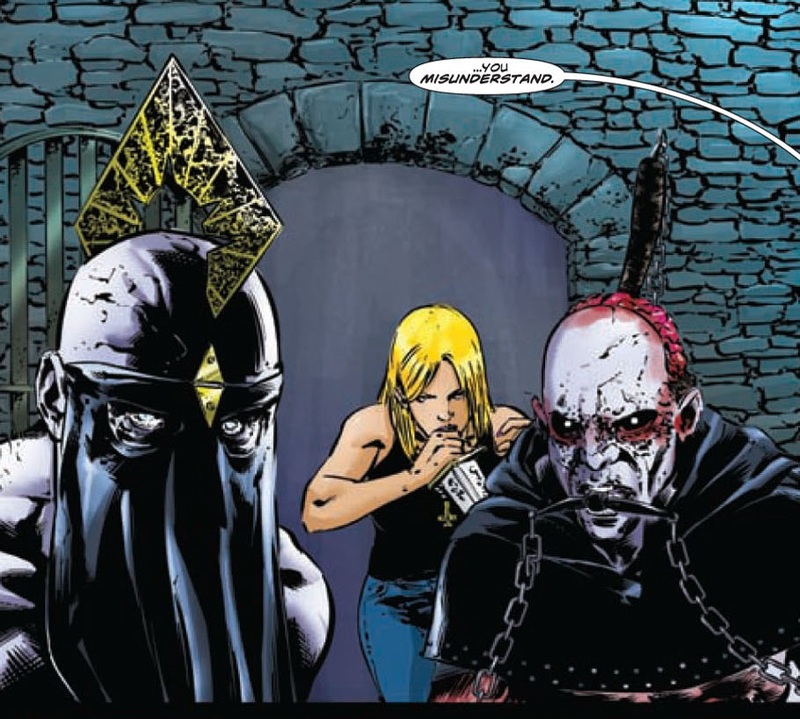 Since his return to the Hellraiser universe, Clive Barker has completely re-imagined the Hellraiser saga, together with co-writer Brandon Seifert (Witch Doctor, Hellraiser: The Raod Below) and art by Tom Garcia, to bring a new direction to one of the horror genres greatest franchises. 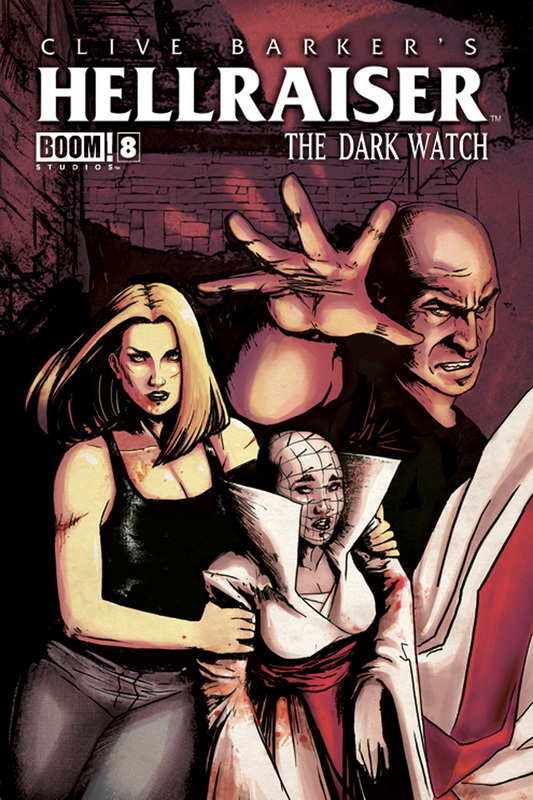 Brandon Seifert does an excellent job of bringing Clive Barker’s vision to life as Hellraiser The Dark Watch#7 sees the action between dimensions escalating, weaving numerous plot threads together, as the series reaches a turning point – the effects of which are sure to have significant implications over the next few issues. Tom Garcia’s art is perfectly suited to the Hellraiser series, every detail of the Cenobites shadowy realm oozes with menace, and the big reveal of The Glyph of the Solutent on the surface of the Labyrinth is stunning. The colors by Valadimir Popov’s are also exceptionally good, especially during the battles, as the muted tones of the Labyrinth give way to the blood splattered carnage. 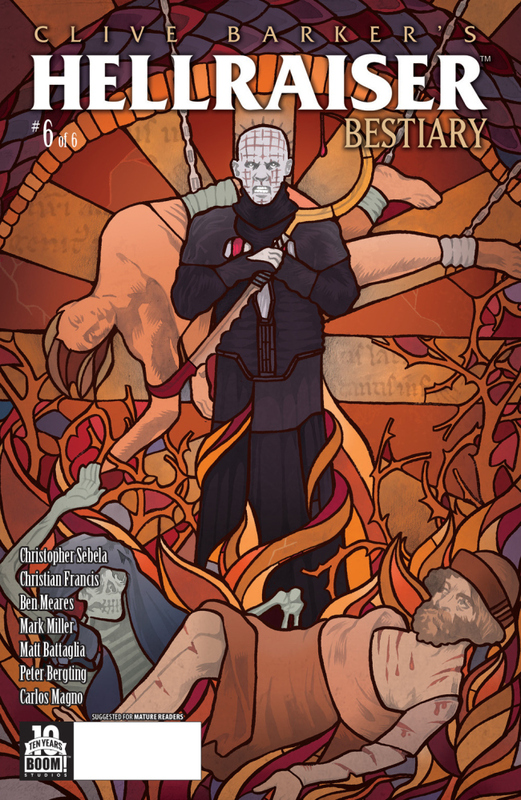 Hellraiser The Dark Watch #7 continues this bold new era for Hellraiser, with its intricate storylines, compelling characters, and great art, this series is a must for fans of Clive Barker and the Hellraiser films.